Egyptian officials said, on Saturday 08/31/2013, they have foiled an attack on a container ship which was aimed at disrupting shipping in the busy, stratigic Suez Canal (aee also – Suez 07.09.09). Canal authority head Mohab Mamish said a “terrorist element” targeted a Panama-flagged vessel on Saturday, but it was undamaged. There were reports of two blasts, but details of the attack are unclear. “The situation was dealt with strictly by the armed forces,” Adm Mamish said in a statement. Egypt’s Sinai has been hit by a wave of violence since the early Egyptian “Arab Spring” which ousted President Mubarak in early 2011. The unconfirmed reports said there were two explosions at 12:30 GMT on Saturday as the ship, Cosco Asia, passed through the waterway. 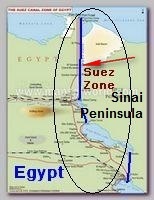 The Suez Canal – between Port Said and Suez – is a vital global trade route between the Red Sea and Mediterranean with worldwide .strategic importance. US warship the San Antonio passed through the waterway, on Thursday 08/29/2013, to join other ships in the Mediterranean that could be used in any strike against Syria after a suspected chemical weapons attack. It is unknown whether the attack was linked to the continuing protests by Muslims Brotherhood supporters against the 3 July ousting of President Mohammed Morsi by the army (see – EGYPTS III REVOLUTION ). The unrest has spilled over into the Sinai peninsula, where Islamist militants have carried out frequent attacks on the authorities. Two policemen were killed in separate attacks on Friday, the interior ministry said. In a separate development, a top militant was arrested in Sinai on Saturday, Associated Press reported, on suspicion of involvement in an ambush last week in which 25 off-duty policemen were shot dead (see – Rafah 08.19.13). The group behind the attack is thought to be linked to Al Qaeda. The man, Adel Mohammed, also known as Adel Habara according to one official, has already been sentenced to death in absentia for killing soldiers in the Nile Delta in 2012. Habara’s arrest could potentially undermine militant activities in the area, where over two dozen security men have been killed alone since July. The security official said two other suspects were arrested along with Habara. On Saturday, an al-Qaeda leader in Iraq released an audio message in which he called on members of the Egyptian army to defect.